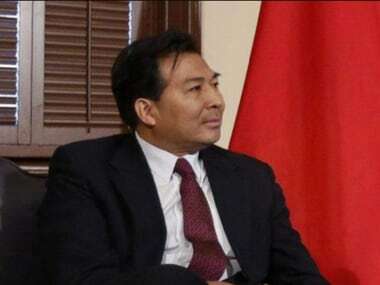 "Bilateral ties between India and China can't take the strain of another Doklam episode," Chinese envoy to India Luo Zhaohui said, emphasizing the need to find a "mutually acceptable solution" on the boundary issue through a meeting of Special Representatives. Zhaohui said, "Some Indian friends" had suggested trilateral cooperation comprising India, China and Pakistan under the aegis of the Shanghai Cooperation Organisation (SCO), which was a very constructive idea. Security cooperation is one of the three pillars of the SCO." Zhaohui further added in his keynote address on 'Beyond Wuhan: How Far and Fast can China-India Relations Go' at an event organised by the Chinese Embassy. Responding to a question on whether a trilateral between the Asian neighbours will help in solving the India-Pakistan dispute, he said "Maybe not now, but in the future, that is a great idea. It will help to resolve bilateral issues and help to maintain peace and tranquillity." Dwelling on Sino-Indian ties, the envoy said, "It is quite natural to have differences with neighbours but they need to be controlled and managed through cooperation." "We need to narrow differences through expanding cooperation. However, it does not mean that differences would be ignored. The boundary question between our two countries was left over by history. We need to build on convergence to find a mutually acceptable solution through the Special Representatives' Meeting while adopting confidence-building measures to maintain the peace and tranquillity along the border," he said. "We cannot stand another Doklam (sic)," the envoy said. Indian and Chinese troops were involved in a 73-day stand-off at the Doklam tri-junction of India, Bhutan and China between June to August in 2018. Luo also suggested that India and China should think about signing a Treaty of Friendship and Cooperation. He said a draft on this was provided to the Indian side about 10 years ago. The envoy said on Monday that China will continue to promote religious exchanges and make arrangements for Indian pilgrims going to Kailash Mansarovar in Tibet. Luo said Prime Minister Narendra Modi and Chinese president Xi Jinping, who met twice in the last two months in Wuhan and Qingdao, are also likely to meet on the sidelines of the BRICS Summit and G20 Summit later in 2018. "The Chinese defence minister and the minister for public security will visit India and the Special Representative Meeting on boundary issue will be held in Beijing this year," he added. Relations between India and China have gone beyond the bilateral scope, Luo said. "We need to enhance coordination and cooperation in SCO, BRICS and join hands to tackle social challenges," he further said. The envoy also called for cooperation between India and China to coordinate each other's positions on issues like rising protectionism globally. "Against the backdrop of anti-globalisation and rising protectionism, China and India, as major emerging market economies, are faced with the pressure of established powers. We should coordinate our positions and also explore ways to be with each other," the envoy said without naming the US. The US has slapped high tariffs on certain steel aluminium products, which has led to a trade-war kind of a situation as other nations too are raising their tariff walls. He said China will import more sugar, non-Basmati rice and high quality medicines from India to reduce trade imbalance. In 2017-18, the trade-deficit (difference between imports and exports) between India and China stood at $63 billion. "We (China) would also like to negotiate a regional trade arrangement with India to expand trade relations," Luo said.